Human capital has always been the cornerstone of Hong Kong's success and the most important element for our economic development. Our manpower situation is, nevertheless, facing multiple challenges in the following areas: impact of external environment, and the quality and quantity of our workforce. First, let us look at the external environment. As a highly open economy, Hong Kong faces many challenges, such as a volatile global economic environment, the rise of protectionism and rapid economic restructuring caused by the development of innovative technology. As the wave of innovative technology sweeps through the world, science in the areas of robotics, artificial intelligence, machine learning, etc. is advancing in leaps and bounds. Technological advancement not only enhances productivity and efficiency, thus improving people's daily lives and creating infinite possibilities for the future, but also brings about wide and profound impact on human resources and the employment market. The irreversible development of innovation and technology has revolutionised traditional business models. Also, automation is expected to bring about transformation in industry structures and job requirements to a certain extent. To compete in such a rapidly evolving environment, our labour force needs to continuously update and enhance their knowledge and skills. Second, as far as the quality of our labour force is concerned, skill mismatches are found in some industries, especially emerging high value-added industries, resulting in a lack of local talent to support the development of a diversified economy. To catch up in the global competition for specialised talent and the development of new industries, we should enhance the quality of our human resources to meet the needs of the new economy. Third, on the quantitative aspect, increase in the size of the labour force has always been a significant impetus for overall economic growth. In the past two decades, Hong Kong had a trend GDP growth rate of 3.3%, of which about 1% was attributed to an increase in labour force. At present, some industries that are indispensable to our economic and social development are encountering a certain degree of labour shortage and recruitment difficulty. Hong Kong is facing the challenge of a rapidly ageing population. In accordance with the Hong Kong Population Projections 2017-2066 newly released by the Census and Statistics Department, the number of elderly persons (i.e. aged 65 or above) will increase rapidly from 1.27 million this year to 2.37 million in 2036, representing an almost twofold increase in the next 20 years. The two figures account for 17.9% and 31.1% of the total population (excluding foreign domestic helpers) in the respective years. An ageing population will cause the problem of a shrinking workforce. 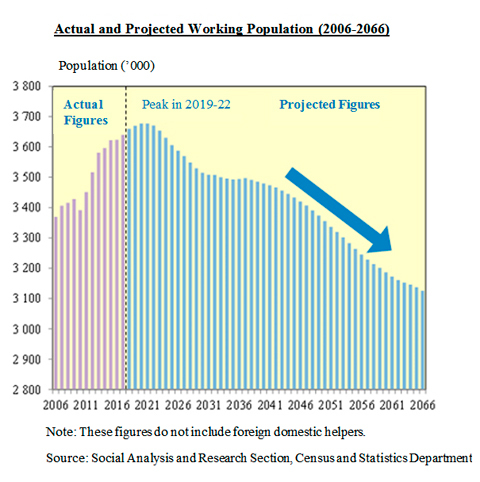 The overall labour force (excluding foreign domestic helpers) is projected to increase from 3.64 million in 2017 to peak at 3.67 to 3.68 million in the period from 2019 to 2022, and then continuously decline to 3.51 million in 2031 and further down to 3.13 million in 2066. The overall labour force participation rate (i.e. the proportion of labour force in the population aged 15 and above) is projected to decrease from 59.1% in 2017 to 49.6% in 2066. Therefore, we must unleash the potential of the local workforce and attract overseas talent to ensure an adequate supply of human resources to promote our economic development. Meanwhile, technological developments have not only accelerated global economic restructuring, but also generated opportunities. Effectively applied, they can help alleviate the pressure of labour force shrinkage on our economic growth, and ease the shortage of manpower in specific industries. Take the elderly service industry, which is relatively tightly-staffed, as an example. The Government has launched the $1 billion Innovation and Technology Fund for Application in Elderly and Rehabilitation Care to subsidise the procurement, rental or trial use of technology products by elderly and rehabilitation service units, so as to improve the quality of life of service users on the one hand, and reduce the burden and pressure on care staff on the other. To this end, the Government will collaborate closely with various industries, the innovation and technology sector, and research and development institutions to explore new technology areas. The Government is committed to enhancing our human resources planning to increase Hong Kong's competitiveness. Since the establishment of the Human Resources Planning Commission (the Commission) under my chairmanship in April this year, four meetings have been held to examine various manpower issues, including Hong Kong's labour market and prevailing human resources policies; strategies for nurturing talent, unleashing the potential of the local workforce and attracting talent outside Hong Kong; manpower situation of various industries and the opportunities and challenges facing them; analyses and studies on the impact of technological advancement on human resources development; and an analysis of the findings of the IMD World Talent Report. To facilitate access of people with different needs to comprehensive information when they make choices on their careers, learning pathways and development trajectories, the Commission has agreed that the Government should put in place a new one-stop portal on manpower information. The portal will provide integrated data and information on major industries, key occupations and relevant training courses to make available more reference materials for people of different ages and backgrounds (including teachers engaging in life planning education and career guidance, students, young people, professionals, technicians, job seekers and academics). In addition, the Commission will consolidate more thematic studies and analyses, including research on the manpower demand of various industries and that arising from large-scale development projects, with a view to developing a comprehensive human resources strategy. Human capital is the most important driving force for the sustainable development of Hong Kong. Nurturing more local talent is the key to success. The Commission will continue to review and co-ordinate our human resources policies and initiatives from a broad perspective so that a comprehensive strategy will be formulated to enable us to address future human resources challenges and to seize future opportunities to promote further development of Hong Kong as a high value-added and diversified economy.